For many years, commentary on Alfred Hitchcock’s work that touched on religion brought up his Catholic upbringing, citing, for instance, his strict Jesuit education as an important factor to consider when trying to understand his films. Then the tide turned. Most writers today soft-pedal the influence that the religion of Hitchcock's youth may have had on his work. (In his adult years, the director rarely went to church and seemed to adopt a casual attitude toward Christianity in general — as far as his private life was concerned, anyway.) I'd like to approach the director's Catholicism from a more nuanced perspective. At least two of his films are explicitly preoccupied with Catholic themes: I Confess (1953) and The Wrong Man (1956). It’s not hard to draw a connection between Hitch’s equivocal relationship with the church and the ironic way it is treated in those movies. "It's nothing for an innocent man to worry about. It's the fella that's done something wrong that has to worry." So say the police who spend the night interrogating Manny Balastrero. He finds that advice to be cold comfort as the jail doors clang shut behind him, an innocent man if there ever was one. There’s a little bit of Catholicism in most of Hitch’s films — even if at times it isn’t much more than an Ash Wednesday smudge. As such, it’s easy to say that he belonged to the 20th century’s small handful of Catholic modern artists — a very short list that also included Graham Greene, (with whom he had tried to work) and Expressionist painter Georges Rouault. 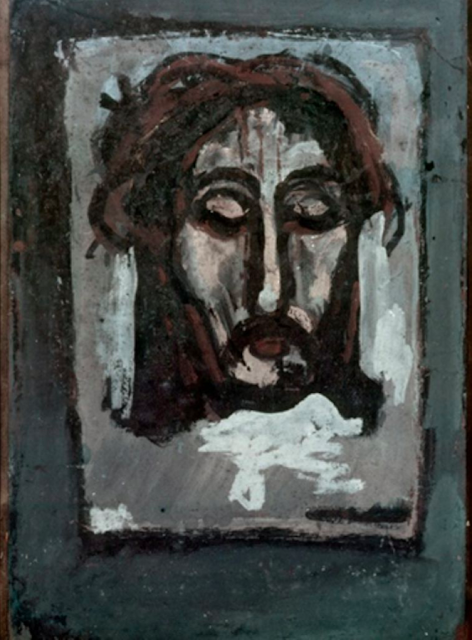 Hitch deeply appreciated the painter, once telling his friend and future biographer Charlotte Chandler that he considered it a privilege to be able to afford a Rouault; one of the artist’s La Suaires (in this case, a death mask of Jesus Christ) even hung in the entryway to his home. Rouault produced several versions of La Suaire. According to biographer Patrick McGilligan, the version that Hitch owned "depicts the face of the Redeemer as imprinted in blood on Christ's burial shroud," and occupied pride of place in the foyer of Hitchcock's Bellagio road home. Perhaps it resembled the one shown here, with its emphasis on Christ's bloodied condition. Every era has its classic portrait of Christ. This one by Rouault, simply called La Sainte Suaire (often translated The Holy Face, but more accurately translated The Holy Shroud; that is, like the Shroud of Turin, this is the imprint of his face upon his burial cloths), may be, at least for Catholics, the definitive Christ-painting of the 20th century. Here, Jesus faces his horror with open eyes and what Buddhists might call radical acceptance. 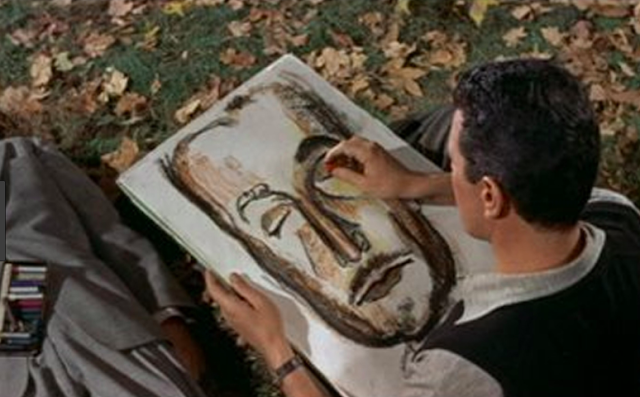 Rouaultesque paintings occasionally pop up in his films as well, often for a laugh—with a sour aftertaste. Sam Marlowe's portrait of the corpse of Harry Worp, in The Trouble with Harry. Mrs. Anthony's portrait of "St. Francis" in Strangers on a Train. Hitch must have seen the painter as a kindred spirit. Both artists dealt repeatedly with the same narrow list of subjects. Said the director to Truffaut: “Not that I'm comparing myself to him, but old Rouault was content with judges, clowns, a few women, and Christ on the Cross.” More or less, those same types keep popping up in Hitchcock's films as well. Curious, isn’t it? "Jesus despised..." from Rouault's aquatint series, "Miserere." According to scholar F. Agustoni, this set "was inspired by the suffering of human beings, which often can be without any reason for those who have to endure it, which makes it even more distressing"—an apt description of Manny Balastrero. Unlike Vertigo's Scottie, he never asks "Why me?" Following Manny's arrest, the film takes viewers in detail through the humiliation of his arrest, fingerprinting and incarceration, ending with the clang of the prison door as it shuts over him—a sequence that fairly imitates a procession through the Stations of the Cross. 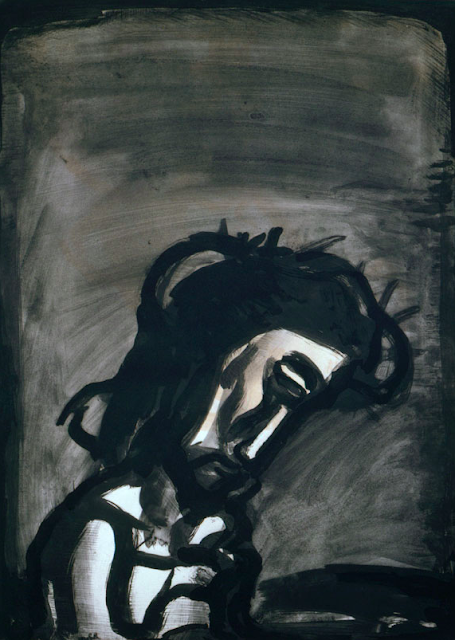 Numerous closeups of Manny capture him with downcast eyes, his face a silent, acquiescent mask—so like Rouault's many depictions of Christ. Such Christ-symbolism was fairly common in midcentury movies — think of Fonda’s earlier role as Tom Joad in The Grapes of Wrath (1940). (And it persists: see Clint Eastwood's performance in Gran Torino.) 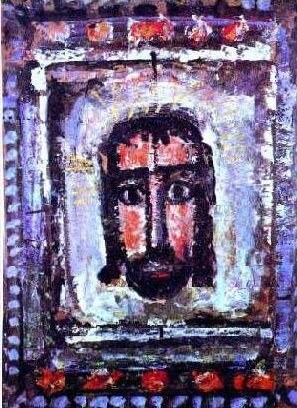 What makes The Wrong Man interesting for me is that it shares Rouault's own view of Catholicism, Christ and suffering. During the early years when Rouault was developing his own voice, he became friends with Catholic writer Léon Bloy, whose novels Le Désespéré (The Desperate,1887) and La Pauvre (The Poor, 1897) deeply affected the painter. Bloy was concerned with suffering, redemption and the rejection of the sordidness of this world, writing, “I have meditated long and often on suffering, I am now convinced that nothing else is supernatural in this world. 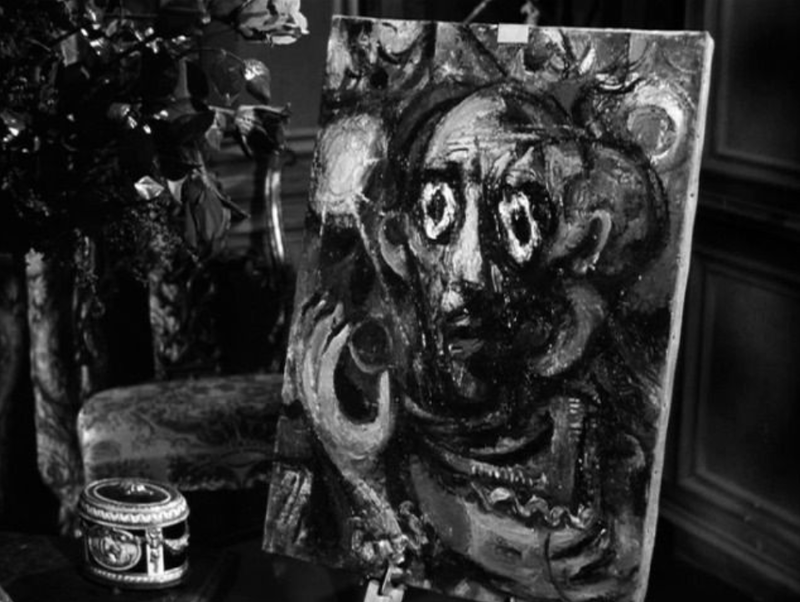 All the rest is human.” Thoughts on the transcendent nature of suffering were expressed by Rouault through his painting—and they approximate Hitchcock’s sentiments in this film as well. That is an apt description of The Wrong Man. Check back to learn more. Great post. Can't wait for the follow up. The Wrong man isn't my favorite film but you now have me wanting to revisit it. This is a very interesting and very informative post about director Alfred Hitchcock. Hitchcock Fact: Aside from an introductory prologue, Hitchcock forewent his usual cameo appearance in The Wrong Man, though he did manage to sneak into some the movie's posters and lobby cards. Artists: Expressionist painter Georges Rouault and Catholic writer Léon Bloy. Joel said,"Check back to learn more..."
Most definitely, I hope to check back and read the next installment in this series. Oops! I forgot to mention that I only watched Hitchcock's The Wrong Man only once...Therefore, I must schedule the film for a re-watch too! Let me know what you think of it upon second viewing! I'am back...after watching Hitchcock the "Wrong Man"
(By the way, What a good place to watch this film...because I kept clicking the next chapter or scene that is posted over there on YouTube...(out of curiosity, but of course! )...until the film reached the end. 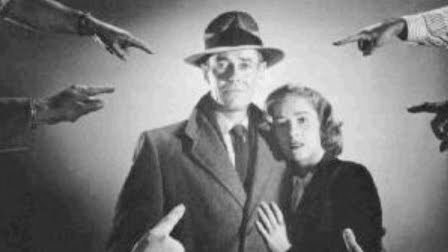 Film noir terms...When some "light" was finally, allow...in after all that "darkness." 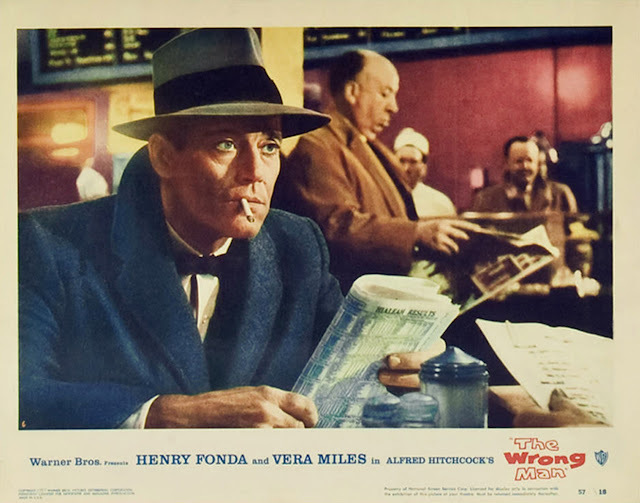 "The Wrong Man is one of the best films ever made on the popular noir theme of a falsely accused man of a criminal act." Joel, It seems after viewing this film for the second time...that I appreciate this classis noir (Even though some fans (and non-fans) of Hitchcock, don't place this film in the category of a film noir.) just a little bit more...here's hoping for a third viewing. Interesting thoughts, Dee Dee -- thank YOU for sharing!